Every marketer I know truly wants to learn the latest hacks, strategies, tips, and even trends that will help them get better results. If this is on your to-do list, then you need to look beyond blog posts, ebooks, and all forms of written content – and spend more time listening to impactful marketing podcasts. When it comes to marketing podcasts, though, it pays to identify the right podcasts that will meet your specific marketing needs. Good news is, we did all the research for you. Louder Than Words podcast with John Bonini was birthed to inspire anyone in a creative position. If you would like to learn the inside scoop of your craft and become a master of creativity, you need to listen to Louder Than Words. The focus is on project managers, creative leaders, writers, designers, and all creators. You can sit down every week and learn from John as he interviews remarkable people that you know. This podcast stands out because the host has a casual way of introducing his guests. Thus, putting them on a pedestal to reveal their creative processes with ease – and you also will be in the right frame of mind to learn. Yes you can delight your customers at every stage of the journey. It’s got nothing to do with your product. After all, people don’t buy products – they buy experiences. The Call To Action Podcast is one of the unique ways the folks at Unbounce deliver top notch content marketing advice to their audience. Although this podcast was born from a minimum viable product (MVP) project, you can glean actionable tips from the interviews for improving your conversion rates. The podcast is suitable for marketers who wants to increase productivity, conversion rate experts. Interested in how content influences your inbound marketing strategy? In Inbound After Hours, the experts from Digital22 interview key inbound marketing practitioners to answer all of your burning questions. Cool feature? It’s also in video format, letting you see the faces and minds behind all of this inbound marketing goodness. Recent episodes include Neil Patel and several members of the Hubspot marketing team. Harvard Business Review (HBR) IdeaCast features the latest thinkers in business. The podcast is most suitable for marketers who want to know the general trends in business and media. Host Sarah Green Carmichael goes straight to the point when she interviews successful businessmen and women. Expect CEOs, Project Managers, Startup founders, Professors, and the like, on this podcast. With that in mind, you already know that episode topics aren’t centered on marketing, but on other advanced topics as well, including aerospace and design. MarketingProfs has been known for its compelling marketing content and research studies. The Marketing Smarts podcast is produced weekly for all marketers at every level. This 30-minute podcast that’s hosted and produced by Kerry O’Shea Gorgone interviews influential marketers, and dissects their plans to help you develop a successful content marketing strategy. In a recent episode, Kerry interviews Peter Friedman, who shares insightful marketing lessons that Steve Jobs taught him. Each episode is packed with marketing insights that you can implement right away. Got a content a marketing question? Ask Amanda About Marketing is the podcast for you. You can ask Amanda Milligan, the Branded Content Manager from Fractl, any of your burning content strategy questions and she’ll give you excellent takeaways. Fractl is one of the top content marketing agencies around. Their clients include eBay, Directv and many others. Amanda takes in user-submitted questions about content marketing and PR and gives straightforward, actionable answers in about 15 minutes. Created by the well-known team behind Copyblogger, this podcast offers quick hits on brands, marketing and of course, content marketing. It’s hosted by Sonia Simone, the chief digital content officer of Rainmaker. It mixes actionable recommendations along with analysis of current marketing news. Really the whole Rainmaker.fm network has great podcasts for everyone interested in any facet of marketing or writing. Marketing Over Coffee podcast with John Wall and Christopher Penn, is a weekly discussion of what’s new and trending in the marketing world. Each episode is news-based, rather than topic-based. The ultimate aim is to keep you updated on the state of marketing, so that you can make informed decisions. Each episode is less than 30-minute long, but it will give you the right thought and inspiration to soar during the day, especially when you listen to it in the morning. Gary Vaynerchuk is that guy who took his family’s Wine Business and grew it from $3M to a $60M in just 5 years. That’s huge! The #AskGaryVee Show started out as a YouTube show, but because of the insights that he shares, each video is repurposed into a podcast for every marketer to enjoy. The episodes are packed with actionable tips that will help you get ahead in social media, entrepreneurship, startups, and family businesses. Each podcast show is 15 – 30 minutes long, where Gary provides answers to some of your burning marketing questions. If you want your questions addressed, you can tweet the host with “#AskGaryVee” and who knows, you may be on the next show. Marcus Sheridan, founder of River Pools and Spas, is the host of “The Mad Marketing Podcast.” Marcus rarely interviews other people. But when he does, you better listen! His culture is simple: He takes your questions and answers them in a more personal, transparent, and honest voice possible. After he became a HubSpot Partner, and actively sharing his marketing experiences and insights on The Sales Lion Blog, he launched the Mad Marketing Podcast to dish out some rare advice on marketing. You should subscribe to his channel today. On the Media is an award-winning podcast. It’s launched in 2001 and has been the most popular programs on NPR. In fact, this podcast has aired on more than 300 radio stations. Hosts Brooke Gladstone and Bob Garfield examine and dissect possible threats to government transparency, and its impact on business. By listening to this podcast, you can uncover the week’s big stories and hidden political narratives. These rare topics can have a multiplier effect on your marketing. Hence, you need to watch and hear “On The Media” podcast. Social Media Marketing Happy Hour is a 15-minute podcast, hosted by Dawn Marrs Ortiz & Traci Reuter. It’s designed for the entrepreneur, small business owner, network marketer, mompreneur, and the like. If you’re tired of traditional marketing best practices, and you need some inspiration to take “that” action step on modern digital marketing strategies, you need to pay attention to this podcast. You can expect a new episode 5x a week, and each one is produced to give you the inside scoop on how to leverage social media marketing platforms to grow your business. Trust me, if you like banter-style marketing podcasts that go deeper into the topic, rather than sweeping through and leaving you hanging, give the Social Media Marketing Happy Hour Podcast a listen. It will be worth your while. Marketing Secrets is the marketing podcast for people that don’t have a lot of venture capital money to burn, but are funding their start-up or new business on their own, one day at a time. 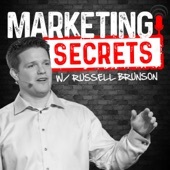 Russell Brunson dives into funnels, coaching and how to relate to your customers. Is there a podcast for all things creative? Absolutely. Traction is a show where the Host Jay Acunzo from NextView Ventures, analyzes the clever, unusual, and brilliant ways entrepreneurs achieve dramatic results. Trust me, you don’t hear such stories and in-depth case studies. They can transform your startup. You may have heard of growth hacks and how powerful they are. But have you been using them? When you listen to Traction Podcast, you’ll learn from Founders, startup executives, investors, and media personnels, as they share their age-long experiences and tricks for generating more leads and turning them into customers. No list would be complete without the kings of content marketing Neil Patel and Eric Siu. In just 10 minutes per podcast, Eric and Neil cover the most interesting, needle-moving marketing strategies every marketer can put to use every day. There’s no excuse not to take a quick listen every day or binge listen on the weekends. Marketers want to know the secret to success. In “Mind Your Business Podcast,” the Host James Wedmore, a seven-figure online marketer shares the mindset of success. He believes that “mindset” comes first, before strategy. Don’t get me wrong. This podcast doesn’t provide the typical “positive mindset” advice that you see flying around. But rather, you’ll learn firsthand how magic trumps metrics, and attitude over action. If you don’t want to let the marketing myths and misconceptions that hustle and hard work are the core of what it takes to become success in business, you need to give this podcast a listen. Amy Porterfield dives into the trenches with you in Online Marketing Made Easy. She explores issues like building online courses, promoting webinars or optimizing social media ads. She also brings on top-notch guests to get their opinion and insights on ways to help your business or marketing department grow. This one is geared specifically to small business owners–those that have expertise in something else besides marketing, but need help with digital marketing. Getting up and running in local search results, optimizing your website and improving the way you do social media, the Duct Tape Marketing podcast will point the way forward. Get leading strategies on finding leads with paid traffic. This podcast will analyze social media ads, retargeting and more and show you how to build good relationships with leads and customers that are acquired this way. It’s jam-packed with actionable strategies that you can use right away. The experts combine expertise from the agency world with in-house business acumen. Darren Rowse is one of the original pro bloggers. He essentially created the genre. In his podcast, he blends teaching, case studies and exercises to create interesting content, and grow your blog readership. Though this is geared towards professional bloggers, any business using content marketing to grow their business will benefit from what Darren has to say. His blogs are read by more than 5 million people per month. Sometimes you don’t need a 30-minute show to drive growth in your business. Perhaps you need it short, but memorable, Growth Byte podcast is your best shot. It’s hosted by Growth Hacker TV. In every episode, the host finds the best startup growth content online, and summarize it in 2 – 3 bytes. These bytes are punchy, and would nudge you into action. These shows are geared at advanced growth hackers. If you’re a beginner, you may want to choose another podcast from the list. Technically, a few of these marketing podcasts aren’t marketing related, but you’ll be inspired by the delightful stories that take a lot of data into action. More so, what you do with every podcast on this page will determine your results. So get started as you keep an open mind. There’s so much that you can learn while listening to a podcast. Did You Forget Parents in Your Enrollment Communications?